[PDF] Hatred of Democracy (Radical Thinkers) | Free eBooks Download - EBOOKEE! 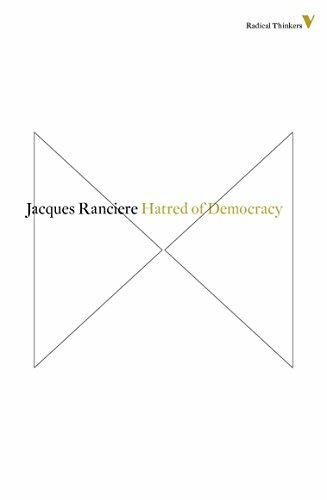 Description: In this vehement defence of democracy, Jacques Ranciere explodes the complacency of Western politicians who pride themselves as the defenders of political freedom. As America and its allies use their military might in the misguided attempt to export a desiccated version democracy, and reactionary strands in mainstream political opinion abandon civil liberties, Ranciere argues that true democracygovernment by allis held in profound contempt by the new ruling class. In a compelling and timely analysis, Hatred of Democracy rethinks the subversive power of the democratic ideal. No comments for "[PDF] Hatred of Democracy (Radical Thinkers)".